League Park had been around before the Indians came along. 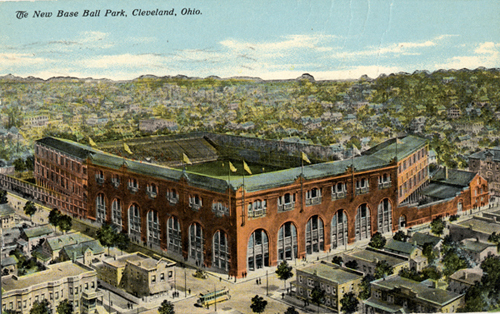 Cleveland had a team in the National League for a while called the Spiders and they played at League Park. Cy Young pitched the first game there in 1891 for the Spiders. Maybe you've heard of him. Now guys like Roger Clemens win awards named after Mr. Young, who died before most of us were born. The main road heading east from Cleveland is Euclid Avenue. Before the advent of the Interstate Highway, that was the street you would have taken to get from Cleveland to places like Buffalo and Boston. When John D. Rockefeller was building his fortune refining oil, he resided on Euclid Avenue. Later in the 19th century, dozens of newly made millioinaires built their mansions on that same street. For over one hundred years the area east of Cleveland that Euclid Avenue passed through was one of the most prosperous neighborhoods in America. Through most of the 20th century, the finest office buildings, department stores and playhouses lined the street. It was in this neighborhood that League Park was built. Today there are some remnants of former times, but most of the once glorious district has decayed beyond recognition. Police officers in urban combat uniforms walk the area in groups of four, and that's on Sunday mornings. Once bustling neighborhoods are eerily calm, primarily because there aren't enough people living there to create a bustle. Close to half of the homes in that part of town have burned or been torn down. Twenty years ago, the neighborhood was full of boarded up buildings, but now even those buildings are gone. At the corner of 66th Street and Lexington Avenue, there is a block that is largely vacant. The block across the street as well as several others close by are also vacant, but this lot has an old baseball park on it. The baseball diamond is in the same spot that it was when the Indians played on it. The outfield is where it always was. A swimming pool is located where the stands once looked out at left field. A small section of the stands behind first base remains, although it is crumbling and a deteriorating fence surrounds it. Behind the stands is part of the original exterior wall. One could walk past it and imagine what it must have been like to go to a game there a lifetime ago. Adjacent to that section of stands is the original ticket office. It was converted into a recreation hall, but it doesn't look like it gets used very much. Just a few feet from the old ticket office and visible from the street is the historical marker placed there in 1979. In 2002, architect Paul Volpe drew up plans to rebuild League Park. The plan called for a rebuilt 4,000-seat stadium and a museum dedicated to League Park's history. The plan also calls for conference rooms, a picnic area and a community park that could host outdoor concerts. That same year, Cleveland mayor Jane Campbell announced the plan to great fanfare and the city set aside $1.7 million to jump-start the renovation. The project's total estimated cost is $18 million.